Our school uniform gives a sense of belonging and community. 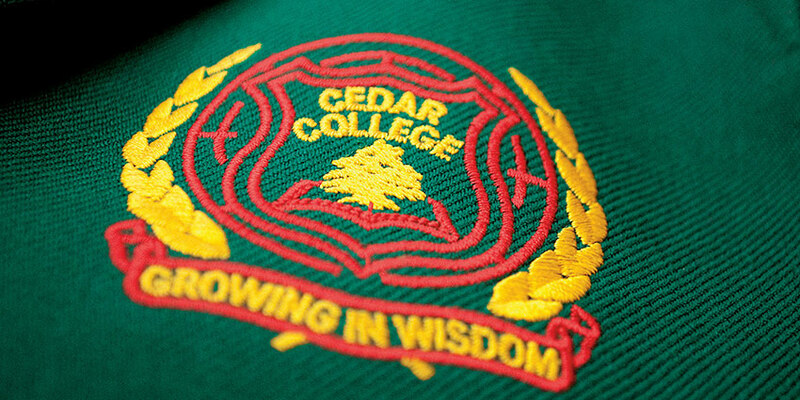 We ask that all students respect the uniform policy, as they look forward to the day when they will proudly graduate in their green blazer. Summer Uniform – is worn in Terms 1 and 4. Winter Uniform – is worn in Terms 2 and 3; however, should the temperature forecast during the previous evening’s news be 23°C or hotter, then summer uniform may be worn. In the first TWO WEEKS of Term 2 and Term 4 there is a TWO WEEK CHANGE-OVER where either summer or winter uniform can be worn. Click here to download the Uniform Policy. 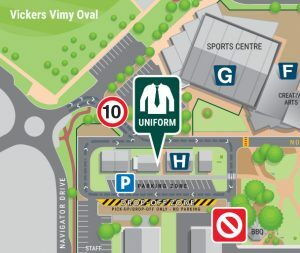 The Uniform Shop is located in the North-Eastern corner of the campus (see map, below), and parking is available in the Vickers Vimy Carpark or the Navigator Drive Loop. It is recommended that all students check their school uniform for correct fit before the start of each term. All school uniform (except shoes) must be purchased from our Uniform Shop to ensure consistency and quality. Download the current Uniform Shop price list here. Payment for all school uniform should be made directly to the Uniform Shop, which has eftpos and credit card facilities available. To minimise the loss of costly uniform items, all uniform items MUST BE appropriately marked with your child’s name, including hats, ties, jackets etc. Uniform Labels are available from the Front Office for a small cost if required. Please check the LOST PROPERTY in the Front Office and High School Office for lost items. Black leather lace up with standard school shoe heels. No platforms, or fancy/elaborate buckles, prints, markings or lacing. Students in Reception and Year 1 (only) may wear black Velcro school shoes if desired. Primary School (R-6) girls may wear an optional black “T-Bar” shoe with a buckle or “Mary Jane” style shoe, however it must have a standard school shoe heel and no fancy/elaborate buckles or patterns (standard school shoe buckles and cutouts are fine). An optional dark brown sandal may be worn by Primary School students during summer months (without socks) with a “T-Bar” or enclosed heel for support. Sports shoes should be of good quality and support, and have non-marking soles.